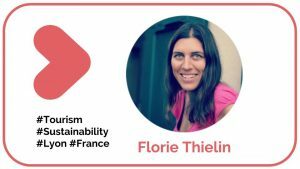 You have decided to work at tackling waste in your tourism/event organization ? Welcome on board! You’re certainly wondering what to start with? No worries, we cut this big “mammoth” into pieces for you 😀 Follow this ABC methodology declined into 10 smaller steps to start leading the change in your tourism or events organization. You’ll need the most senior people in the company (your top hierarchy) to buy into this Let’s tackle the waste! impulse and show that they are committed. You’ll need some time, resources and leadership commitment. Without this, it will be harder to move ahead. You’ll also need to raise your staff awareness: why is it important to tackle the waste issue? Make them understand the global and local stakes, and allow them to feel involved from the very first steps of the process. There are people at all levels of your organisation who will (hopefully) get excited about this and be willing to get involved, empower them! Provide them with time and resource to realize an initial waste audit. Pick up key indicators to measure what is the current situation: what are your bins composed of? In case of an event, think about the different steps of the event proceedings to anticipate and estimate all potential trash. Inform yourself about your destination waste treatment system. Where are the different waste processing centers? How are they currently equiped? How do they sort out waste? What would be the modalities and costs for your organization to dispose there some of your waste? Are there some social entrepreneurs with whom you could partner? Also if you’re working in a country that is new to you, try to understand the behavior anchored in the population concerning waste management. Think about all your different external stakeholders such as suppliers, customers, local community… Make sure they feel and get involved in the project. Share with them the vision you have defined in the previous step. Don’t be ashamed of not doing much so far, don’t boast about what you might already do. Instead reach them out asking for a feedback: what could be changed / improved? Gather all the ideas of potential/available solutions that you collected from your different stakeholders: both internally (employess during the waste audit) and externally (customers, suppliers, local entrepreneurs/community…). Identify key solutions to start with, and make propositions -remember that the objective is not to implement them all at once, with a risk of quickly feeling discouraged. Instead start with a few solutions, the most relevant, engaging, impacting and easy to implement ones. 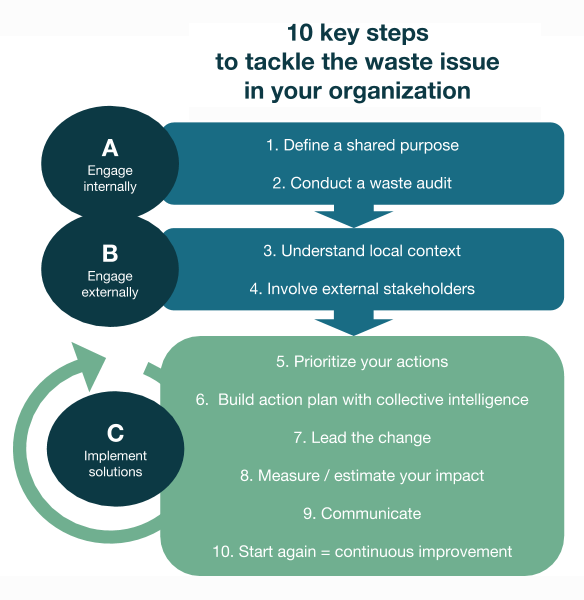 This step is particularly relevant for large organisations – When they are numerous people involved in the waste management, make sure to include their insights and to listen for potential resistance to change. Involve them by organizing a collaborative creative workshop. You can rely on their daily on-the-field and user experience to build realistic taylor-made solutions. Design a detailed and SMART action plan! Make each of your “waste reduction” volunteer employees in charge of implementating and following-up on one solution. In bigger organizations, you could challenge each group or department to develop and implement one idea. Make it part of their annual performance goals. Encourage healthy competition by identifying a prize for the individual or team with the best idea. Follow up on a few easy key indicators (usually the same ones you used during Step 2 – waste audit) in order to be able to measure your progress and impact (or at least estimate them). And of course, to celebrate successes with your employees! Communicate internally and externally to your different stakeholders to raise-awareness, inspire other organisations and also influence your guests behaviour. Communicate your successes but also about the next challenges identified. Nobody is perfect, be honnest about it, you’ll gain in credibility and trust. Use metrics which are striking: instead of “we saved X amount of waste.”, prefer “We saved X trees in 2019 compared to 2018.” Celebrate publicly and use encouragements to continue! Organize another meeting with your green team to pick up new waste solutions to implement and go again through steps 5 to 9. It’s all about continuous improvement 🙂 Do you face specific challenges and/or found new solutions? Help us to improve this collaborative toolbox, join the discussion on the Facebook group.